A friend of mine asked me if I would like to work in the saw mill for a few months, so I asked mom and dad if it would be ok to go. It was between Fredericton and Woodstock. They thought that would be ok. We left one Saturday afternoon about two o’clock and we never got there until after dark. It was a very long drive. We were staying in a private house with the people we were going to work for. When we met the people, they were very nice ordinary people like we were. Monday morning we started working in the mill. The mill was running with a steam engine. 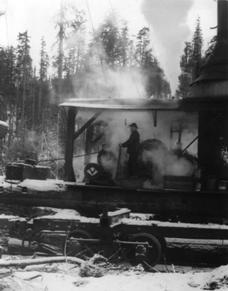 I had not seen a mill working with a steam engine before, so it was something for me. It was not a very big company, his name was Henry Bourque, he owned the company, he passed away, and then his wife and two sons were running the business. We were six employees and some of them were neighbors. We only worked there for two months, my job was throwing the wood out from the trimmer saw. The guy who was running the saw, he was hyper, so one day we were working and I went to grab the wood off the trimmer and he cut the tip of my finger off, he just got a little bit of it. It wasn’t too bad, they wanted to take me to a doctor in Woodstock and I said no, I will survive. We wrapped it up in a piece of cloth then I used a glove and went back to work again. On Saturday night we used to go to Fredericton. We couldn’t do too much because we could not talk English. We would go to the five and ten store. One night when I went there (in those days we had to wait for the clerk to give us whatever we needed) I wanted to buy me a pair of socks, I was an hour waiting for the girl to serve me, I was looking somewhere else , she asked what can I do for you? I got so excited that I couldn’t tell her what I wanted in English, so I said to her, I want (deux pair de bas) and that means two pair of socks. We would buy a few things then we would go back to the bus station and wait for the bus to get back home. We were only making two dollars a day but we didn’t have to pay board. It wasn’t too bad but it was a good experience. We worked there till the first week of December. One day we started for home, we took the bus that was coming from Woodstock to Fredericton. Then we had to start looking for a railroad station, we found the railroad and there was a guy working on the track, and I said to my friend you go and ask that guy where the station is, you can talk English better than I can, so he went over and he asked him where the station was in French and that guy didn’t have no idea what he was talking about. My friend came back to me and said, let’s go back to the bus station. So we went back to the bus station. And after a while it come to us that their railroad station was called (station) so we went back to that same guy and asked him again where the station was, but in English this time, now he knew what we were talking about and he told us exactly where to go, we did find it. We got our tickets to Newcastle Miramichi. We got there sometime around 11 o’clock at night. We didn’t have enough money to go to a motel so we spent the night at the railroad station, as there was no train available until the next morning. We had to take the train to Rogersville. We were on the train three quarters of an hour and then we had to walk 10 miles to get home, but we finally made it!